Old Amersham is probably the most attractive town I've ever visited. It's like being in a period film set. Just picture perfect. And the countryside around is the rolling green Chiltern Hills. This visit, my daughter and I climbed the hill at the back of the cemetry and admired the fantastic view pictured above. It makes you feel lucky to live in England's 'green and pleasant land' and envious of the locals who live in houses like the one pictured above. But maybe it's enough to visit once in a while and enjoy the great food at The Grocer where we ate mozzarella and avocado salad with goat's cheese and roasted vegetable toasted sandwiches at lunchtime. There's a good charity shop in Amersham and an excellent toy shop called Ring O Roses. Meanwhile back at the coal face (!) ie. Handmade Happiness I am busy making unusual necklaces. Pictures to come! Ruth Ellacott makes rag rugs and applique pictures. Buying something other than clothes for the men in your life can be difficult. Yes, you can get them a bottle or two or fancy food but to find something different that you think he'll really appreciate is hard. I think most men would enjoy using the pens that Harry Butler makes. 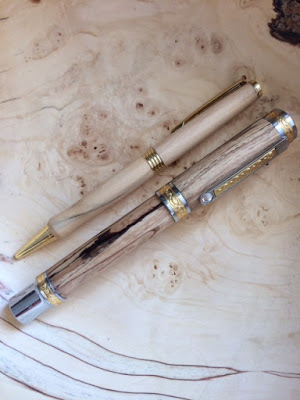 The smooth wood is a pleasure to hold and the fountain pens are unexpectedly weighty. 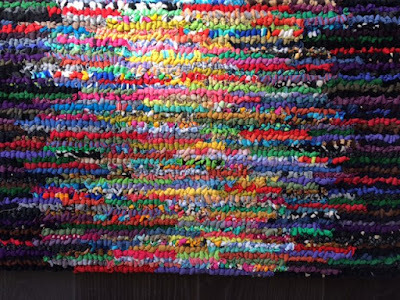 I've sold several of Ruth Ellacott's arty rag rugs in the past. 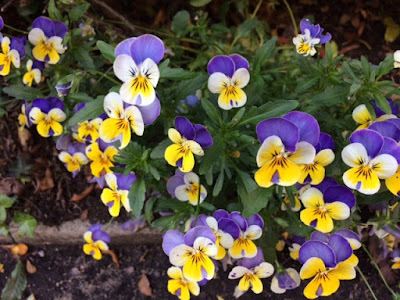 They're a bit special too and often trigger memories of peoples' grannies using every bit of worn out fabric that would otherwise be thrown away or used as cleaning cloths to create rag rugs during and just after the second world war. Make do and mend. Now that we're trying to cut down on the amount of rubbish we produce that old expression might come back into fashion. Pretty as cup cake decorations! I was lucky to spot these tulips in Waitrose as it was closing for just 65p - reduced right down from £10. Who could resist? 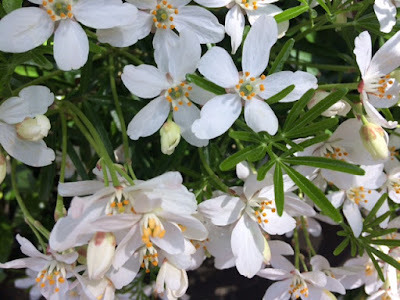 I don't know what the white flowers are called - stephanotis(?) but as I passed them they smelled divine! And seeing violas always makes me want to paint some on something! 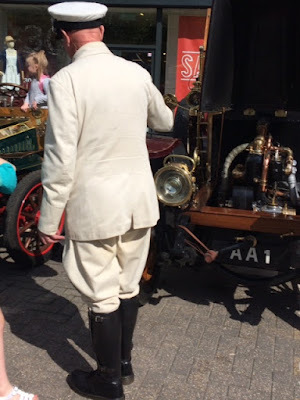 There was a Victorian Day in the Square yesterday run by the Museum. This smartly dressed man was telling people about the well-maintained car behind him. I got some old design notebooks down from the loft - I've always recorded what I'm making and more interestingly what I intended to make but somehow didn't get round to. I'm visiting Dulwich today. I'll take an old notebook to read on the train. So pleased to receive these beautiful baby blankets made by Kate Box. They are the softest thing, not to mention the most stylish thing to wrap your baby in. And if you don't have a baby you can wrap one round your neck or shoulders as a warm scarf! I also collected 100 flyers from the printers yesterday. These will be used to publicise the shop. It isn't in the centre of town and some people still haven't discovered it. Those of you who know me well know that I couldn't have made that flyer myself. I can cope with blogging and instagramming but I can't design anything online. Amy Lague set it up and then Duleep Wickramasinghe, my friend Niloo's husband, kindly gave it his time and attention to give it the professional look it has now. Thank you so much Amy and Duleep. As my mother always used to tell me, I am lucky with my friends. So true. 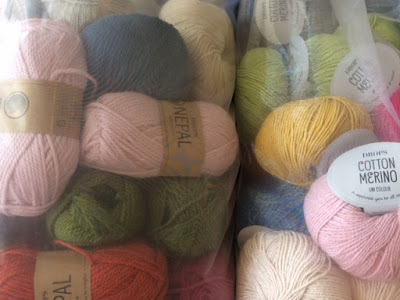 Natural knitting wool now in Handmade Happiness! Sacks of yarn arrived in the post yesterday! Some of it went straight in the window! Before I opened Handmade Happiness seven years ago I wanted it to sell wool. My dream then was to have a habadashery shop which also sold beautiful examples of things that could be made with the things it sold. The best craft I could find, made from the best materials! However there is already a wool shop in the area at Liss so the yarn companies that supplied them could not supply me. That is the reason Petersfield has no wool shop. 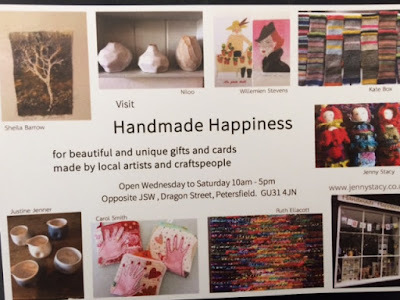 So Handmade Happiness has always just sold the wonderful things people create and no craft materials. But now I am re-visiting the original dream by stocking alpaca yarn, 100% wool and half wool, half cotton yarn. Everything natural and soft. It's what I use for knitting and crochet. I'll let you know how customers react. However the new yarn will only take up a fraction of shop space. The main focus is still the work of talented artists, most of whom live in and around Petersfield. Walking at The Hangers near home. I'd always wanted to visit Grayshott having heard good things about the shops there and yesterday I went and was not disappointed! Bells and Whistles, top picture, is a new, pretty interiors shop. 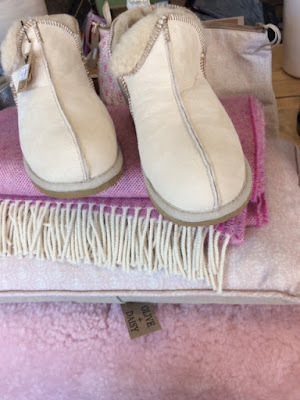 Even on the hottest day of the year I thought how cosy these Swedish sheepskin slippers would be in winter and the pink sheepskin rug would look fab in a girls' room. Hill and Co is a spacious shop housing lovely, colourful clothes and all kinds of unusual gifts. I admire the kantha quilts, especially the ancient ones with tiny running stitch embroidery on faded colour cottons. Hill and Co also had some nice painted furniture and attractive jewellery. When I went into Pins and Needles, a wool and fabric shop, the owner, Fiona was patiently explaining to someone over the phone how to knit...I was immediately impressed with her patience and level of customer service!! Even more so when she came off the phone and told me that the customer needed instruction but had bought her wool and pattern online, not even from Pins and Needles! The last thing I need is more wool but I couldn't resist buying some colourful balls of a silk blend yarn that I'll crochet with. Two of my children and their families visited on Bank Holiday Monday. And on one of the hottest days of the year we went on a cool walk at The Hangers where I photographed this little waterfall. Eleanor Childs has just delivered two paintings showing local views to Handmade Happiness. It is lovely to see people recognise places they walk or even views they can see from their house as happened with the last one of Eleanor's paintings sold in the shop! Petersfield is officially in An Area of Outstanding Natural Beauty and I feel very lucky to live here. I plan to walk across part of the Downs with two of my children and their families on Monday. I'm really looking forward to that. Meanwhile it's Saturday again and the busiest day in the shop. Handmade Happiness has so many good things to admire and to buy. If I have any talent it is for selecting the best art and craft I can find. Many years ago I had an agent and some of my best orders were achieved through her. I think I would be a good agent. But I am an agent just for my lovely shop. Looking back at some of my earliest blog posts the blog was all about me and what I was making and who it was for. Now the blog is about other peoples' work and promoting the shop. So like it or not I've turned from being a maker into being an agent! I hope that over the course of this year through frequent blog posts you'll see me making more while at the same time continuing to draw your attention to other makers of good things.